Thank you readers for your patience during the extended quiet time here on my blog in 2014. This year started off with the challenge of recovering from the loss of my home during the Big Sur fire in December 2013, where many of my friends and neighbors also lost their homes. Fortunately, with the generous help of the Big Sur community, family, and friends I’ve been able to set up a new home and am back doing my forest restoration work. There are many results from the past year that I plan to show in coming posts in 2015. Let me start with a milestone, the first 10-year results of fire mimicry methods employed on oaks that I have documented. 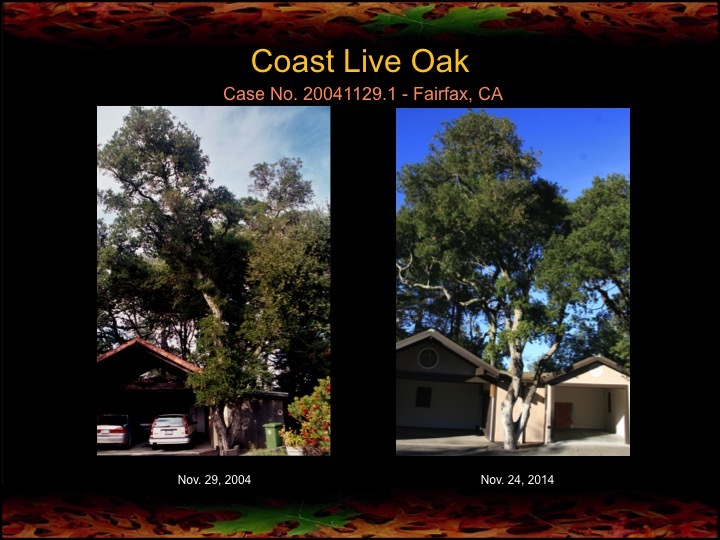 These results come from Fairfax, CA and much of the credit goes to Leith Carstarphen who has been applying the methods I showed him 10 years ago on the coast live oaks below.